Finally Apple is in the streaming game. Other than to say that it looks like Apple has made a big first step towards making streaming ‘ready for primetime’ and to becoming a music platform I’m not going to add to the list of reviews and first impressions, there are plenty of good one’s like Walt Mossberg’s. Instead I’m going to run through a few of the likely milestones and unintended consequences that we could see over the coming months. As we revealed on our MIDiA Research report on Apple Music back in March 28% of iOS users stated they were likely to pay for the service. Among downloaders the rate is 39% and for existing subscribers that rate rises to 62%. Consumer surveys of course always over-report so we shouldn’t expect those rates of paid adoption but the relative values are interesting nonetheless. Given that 50% of existing subscribers are iOS users the implications are that a big chunk of Spotify et al’s subscribers will at the very least try out Apple’s 3 month trial, which is plenty enough time to get build a comprehensive library of playlists and to get hooked. But there is also going to be a big wave of downloaders that do not currently subscribe that will try it out. Given how the iOS 8.4 update virtually pushes iTunes Music users into starting the trial on updating, expect pretty widespread uptake of the trial. Apple reached 11 million users for iTunes radio within 5 days of launch, 21 million within 3 months. Apple Music has had a far bigger build up and is much more deeply integrated into iOS so a fairly safe bet is that those numbers will at the very least be matched. Apple royalties will be a mixed bag: As the ever insightful David Touve pointed out with iTunes Radio, Apple has proven adept at striking licensing deals that appear to pay above market rates at a headline level but that in practice can work out lower. A key reason for this is the fact iOS users’ existing music collections are integrated into the service and plays from these will generate much lower per stream rates, more in line with licensed locker services. Add into this the fact that semi-interactive radio and broadcast radio are part of the proposition (both of which also have lower per stream rates than on demand) so the blended per stream rate may disappoint. Expect a stream (pun intended) of irate artist CD Baby statements showing their Apple per stream rates. Download sales will suffer: If a streaming service does its job properly users should have no reason to buy downloads any more. Initially there may be a mini surge, a dead cat bounce as first time streamers discover new music and buy downloads out of habit. If this happens expect Apple to make a song and dance about it. But that will be a temporary phase. iTunes downloads will decline thereafter. Artists may have complained about theoretical lost sales from Spotify, they will be actual lost sales from Apple. What everyone will be hoping for is that enough lower and infrequent spending download customers get transformed into 9.99 a month customers. But that will take more time. So expect three, possibly four key stages to Apple (lower case ‘m’) music revenue: 1 – mini revival; 2 – sharpish decline; 3 – steady recovery; 4 – growth? Spotify per stream rates could go up: If enough existing subscribers take up the Apple Music trial but don’t cancel their subscriptions, the royalty pot for Spotify et al will remain the same but play volumes will decrease. This means that the per stream rates for Spotify and co could actually increase for a while because the revenue will be split across a smaller number of plays. So expect artists to see a very pronounced, albeit temporary, difference between what Spotify pays from (paid) streams versus Apple. So Apple will be for once upsetting everyone else’s streaming apple cart with its long anticipated entrance but there will be a superficially confusing set of mixed messages and metrics. Which means the time to properly measure Apple Music’s progress will be 6 months or so from now. Until then expect to be simultaneously impressed, concerned and confused. What do Netflix and music subscriptions have in common? They both experienced slowing growth in 2014 in the US. Subscriptions are the monetization focal point of streaming but there have long been signs that the market opportunity is far short of the mainstream. Reports suggest that Spotify may (finally) be about to launch video, as a means of differentiating in an increasingly competitive marketplace that is about to get a whole lot more competitive on the 9th of June (i.e. when Apple announces its long mooted arrival into the space). Spotify needs a differentiation point. It may be the runaway market leader but it doesn’t have the feature badge of identity that many of its competitors do (e.g. Rdio is the social discovery service. TIDAL is the high def service. Beats is the curation service etc.). However, even with a feature differentiation point, Spotify and all of its subscription peers face a more substantial challenge than competing with each other: they are collectively in danger of banging their heads on the ceiling of demand for music subscriptions. The world is unequivocally moving from ownership to access and streaming will be a central component of this new consumption and distribution paradigm. 9.99 subscriptions however have no such mainstream inevitability. They are too expensive for most consumers but most crucially they require consumers to pay for music every month when most people instead spend when one of their favourite artists is in cycle with a new album, single or tour. Over time (a half generation or so) some consumers will have their behaviours modified, but the majority will not. In some sophisticated markets (such as South Korea, the Nordics and, to some degree, the Netherlands) subscriptions are showing some sign of edging towards a wider audience (though still far short of mainstream). In most major music markets though, they remain firmly locked in single digital percentage adoption ranges. They are niche services for the high spending aficionados. But this isn’t solely a music subscription problem. 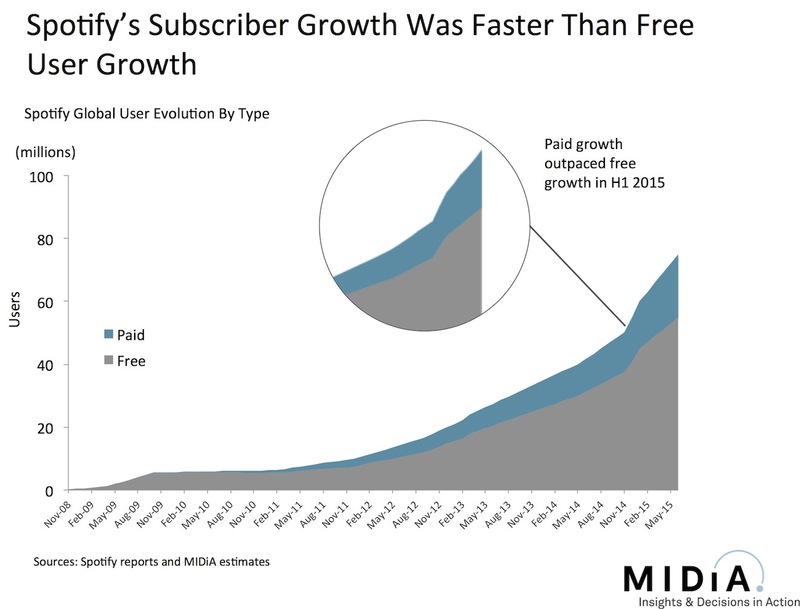 It is a dynamic of digital subscriptions more broadly. Take a look at the US. In 2014 net new subscribers (i.e. the amount of subscribers by which the market grew) fell to 1.5 million, down from 2.8 million in 2013 – which translated to a 46% decline in net adds. And that was in one of the highest profile years yet for subscriptions. Over the same time period, Netflix’s net new US subscriber growth fell from 6.4 million to 5.7 million, which was a more modest 11% decline in net adds. This is not to say either business model has run its course – far from it, and of course both sectors still gee in 2014 – but instead that premium subscriptions are not mass market value propositions. And once you have mopped up your early adopters and early followers growth inherently slows. The music industry may be locked in an identity crisis over how it deals with freemium services, but it needs to have a realistic understanding of just how far subscription services can go without lower price tiers and more ability for users to easily dip in and out and, ideally, pay as they go rather than being tied to monthly commitments. 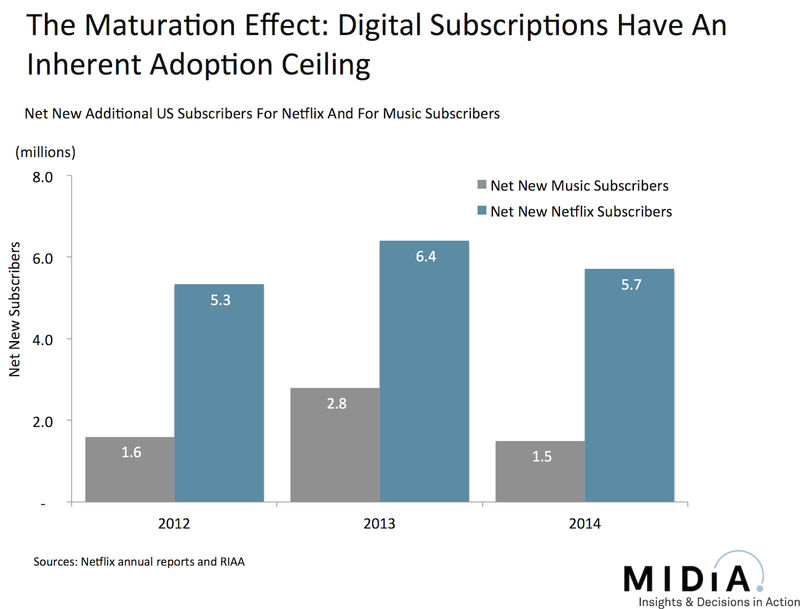 The incessant success of YouTube and Soundcloud show us that mainstream consumers want on-demand music experiences but the slow down of subscriber growth in the US shows us that the incumbent model only has a certain amount of potential. Sure, Apple will doubtlessly unlock a further tier of early followers to meaningfully grow the market, but it will only be a matter of time before it hits the same speed bumps. Access based models are the mainstream future, subscriptions can be too, premium subscriptions though are not.